A new solution for Getreidemarkt has been announced today. This 4 lane motorway is to be made more attractive for cyclists with this solution. At the moment this is a very exciting and dangerous place to ride. You come down hill fast along a extremely narrow strip and merge with 3 lanes of (50kmph max speed (realistic 65kmph)) cars who compete for position in the 4 lanes at the next junction. 2 to go straight, 1 is right turn only and one is both. This means on a bike you have to take the second lane. This is all good fun for people who like extreme sports. The new solution forces you to pull out at a specific point rather than pick you gap so I see it doing nothing for safety (or making this at all attractive) for anyone on a bike. How would the Dutch fix this? Here is the cycle network on radlkarte.at.There is a missing connection between the Mariahilfe Strasse junction and the Treitistrasse, and also the Kostlergasse. So let fix this huge and obvious whole in the cycle network. This is what it looks like from above. Here is a very quick sketch of how a bidirectional cycle path could be easily fitted into this space. Coming down the hill there will be 3 lanes not 4. A curb or small wall is needed as a barrier. 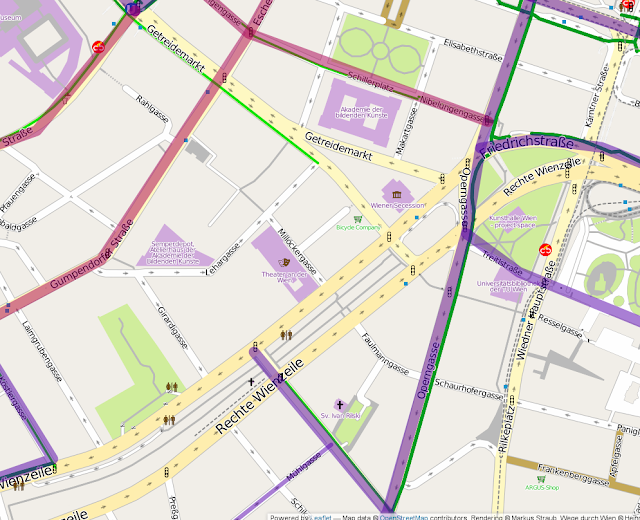 The traffic lights can be timed to remove all conflict at the junctions if necessary. 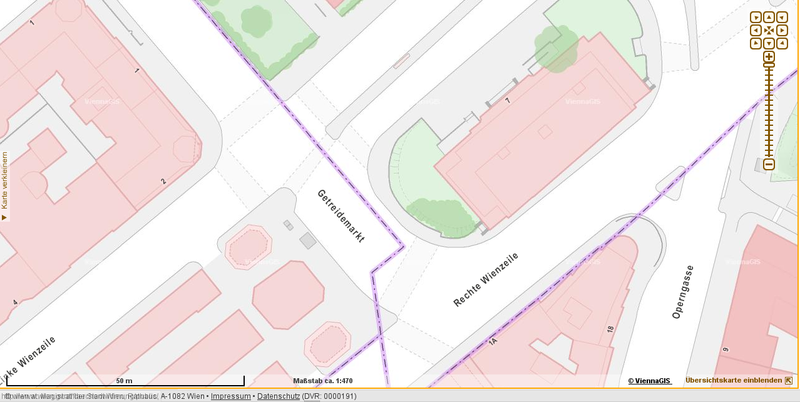 One of the 4 lanes of parking could be used to create a bike route along the Wiener Strasse. 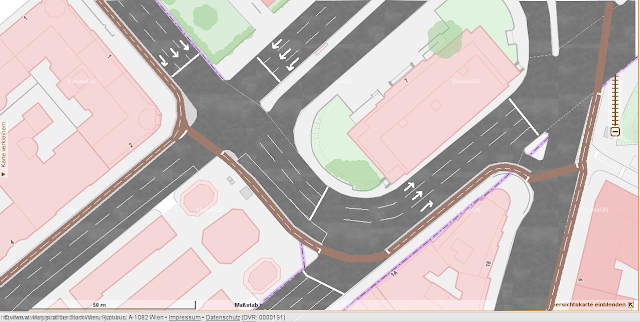 This would reduce peak traffic capacity of the junctions a little and reduce parking by a maximum of 25% but it would be a solution that would be comfortable and convenient to use and a real improvement for people on bikes. Cycle traffic will never be a significant proportion of the traffic unless it is granted some space. 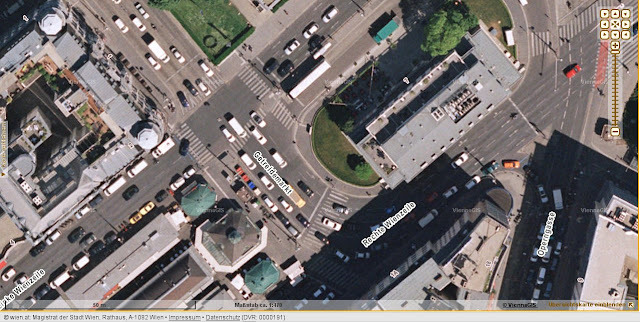 Just 1 of 8 lanes along the Naschmarkt are required for a solution here. If there is not enough space for just 1/8 of the space to be allocated for bikes then there is not enough space for modes of transport that are inefficient with space use. This needs to be done properly or it will be a waste of money. Spending 200000 Euros on a strip of paint down the middle of a motorway and saying this will be a safety improvement for bikes is nothing other than incompetence and a waste of tax payers money. 3 dead Austrian cycists under trucks in 5 days. Another Summer Another Death by Design. Death as a result of design. Are Road Designers Trying to Kill Cyclists?